Netanyahu criticizes leftist activists who heckled and booed Minister Tzachi Hanegbi at Rabin memorial. 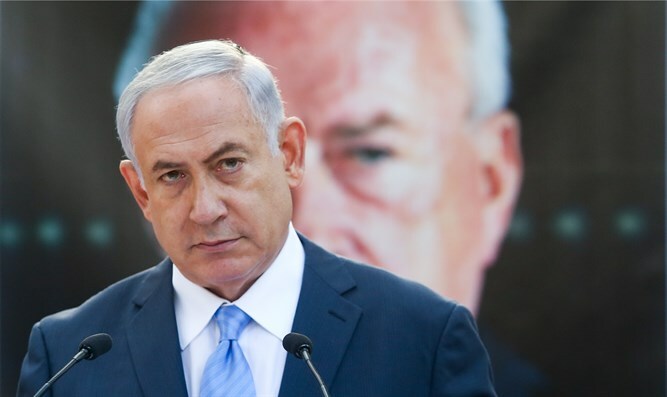 Prime Minister Binyamin Netanyahu on Saturday night criticized the leftist activists who heckled and booed Regional Cooperation Minister Tzachi Hanegbi at the memorial ceremony for assassinated Prime Minister Yitzhak Rabin in Tel Aviv. “It is regrettable that the memorial ceremony for the late Prime Minister Yitzhak Rabin became a political conference. Those who champion freedom of expression try to silence anyone who disagrees with them,” tweeted Rabin. Hanegbi, a long time Likud lawmaker, was loudly booed during his speech. Many of the rallygoers were also shown making obscene gestures at the veteran legislator. Jewish Home chairman Naftali Bennett earlier on Saturday night blasted the memorial rally as a "shameful leftist demonstration". Minister Gila Gamliel (Likud) also denounced the "shameful scenes tonight in Rabin Square. A bunch of anti-democratic shouts who do not respect a minister elected in the government, and then they preach to us about division and tolerance." Deputy Foreign Minister Tzipi Hotovely also criticized the conduct of the leftist protesters. "After the rally tonight, the left should stop lecturing us about freedom of expression and democracy. The incitement toward the majority of the Israeli public on the right and the center will leave the left in the opposition for many years to come," she said. The Meretz party initially expressed outrage after it was announced that Hanegbi would speak at the Rabin memorial. Later, however, Meretz chairwoman MK Tamar Zandberg agreed to speak at the memorial ceremony.